You can Ritual Summon this card using "Troll Tax Returns". Each player must pay 500 LP each time your opponent Special Summons exactly 1 Monster from the Extra Deck. Once per turn, you can shuffle 5 Extra Deck Monsters with different names in either player's GY into the Extra Deck and if you do, draw 2 Cards.. This card is used to Ritual Summon "Rich Troll Lord of Avarice". You must also Tribute Monsters from your Hand or Field whose total levels equal the Level of the Ritual Monster you Ritual Summon. During your Main Phase, you can banish this card; this turn, any Monster destroyed by battle with a Ritual Monster you control is Special Summoned to your side of the Field. You can Ritual Summon this card with "Darkest Aura of Zera". Your opponent cannot Tribute this face-up card on the field, also they cannot target it with card effects. You can only use each of these effects of "Darkest Zera, Archfiend of the Lair" once per turn. ● If this card is Special Summoned: You can target 1 Normal Trap Card in your GY; Set it to your side of the field. ● If a DARK monster(s) you control is Tributed (except during the Damage Step): You can target 1 face-up monster on the field; make it either gain or lose 1000 ATK until the end of this turn. ● (Quick Effect): You can Tribute 1 monster, then target 1 face-up card on the field; negate its effects. This card is used to Ritual Summon "Darkest Zera, Archfiend of the Lair". You must also Tribute DARK monsters from your hand or field, whose total Levels equal 8 or more, but do not exceed 12. 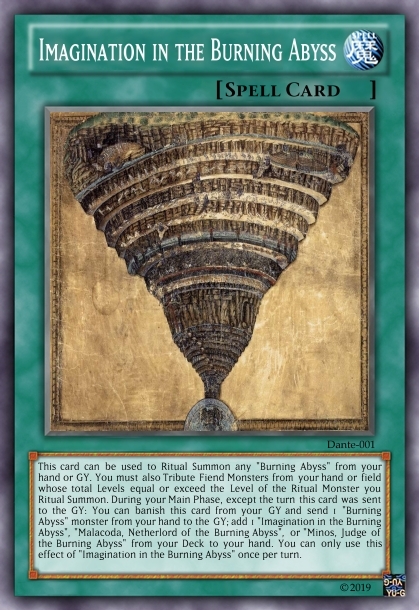 If "Lair of Darkness" is in a Field Zone, you can also Tribute DARK monsters your opponent controls, in which case, you can Tribute Xyz Monsters your opponent controls using their Ranks as if they were Levels, and Link Monsters your opponent controls using their Link Ratings as if they were Levels, but doubled. If a DARK monster(s) you control would be destroyed by battle or card effect while this card is in your GY, you can banish this card instead. During the Standby Phase of the next turn after this card was banished: Return this card to your GY. Next Card: Make a retrain of a non-Effect Ritual Monster, and its Ritual Spell. Bonus points if it is NOT Hungry Burger. You can Ritual Summon this card with "Legend of the Mirror". Monsters your opponent controls with 2000 ATK or higher cannot declare an attack, also their effects are negated. When this card leaves the field: Destroy all monsters on the field with 2000 ATK or higher. This card is used to Ritual Summon "Purple Mirror of the Fiend". You must also Tribute monsters from your Hand or Field whose total levels equal or exceed 6, OR Tribute 2 or more monsters from your Hand or Field whose total ATK equals or exceeds 2000. Fiend's Mirror + the "purple mirror" urban legend = this. Edited by 8bit Moonside, 05 November 2018 - 03:32 PM. You can Ritual Summon this card with "Imagination in the Burning Abyss". Once per turn: You can target 1 level 3 "Burning Abyss" monster you control; either double the target's level or you can have that monster be treated as 2 monsters for the summoning of a "Burning Abyss" monster. If this card is sent to the GY: you can send 1 "Burning Abyss" card from your hand to the GY; special summon this card. This card can be used to Ritual Summon any "Burning Abyss" from your hand or GY. You must also Tribute Fiend Monsters from your hand or field whose total Levels equal or exceed the Level of the Ritual Monster you Ritual Summon. 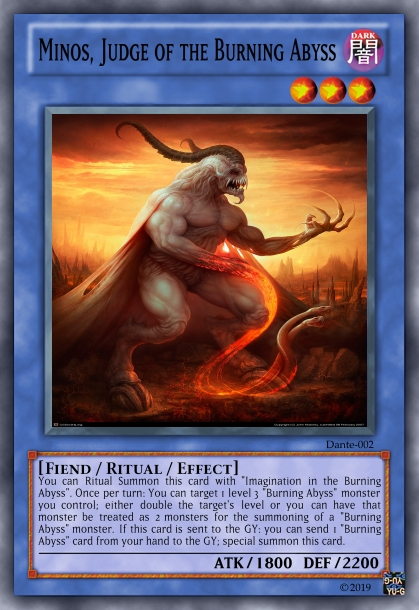 During your Main Phase, except the turn this card was sent to the GY: You can banish this card from your GY and send 1 "Burning Abyss" monster from your hand to the GY; add 1 "Imagination in the Burning Abyss", "Malacoda, Netherlord of the Burning Abyss", or "Minos, Judge of the Burning Abyss" from your Deck to your hand. You can only use this effect of "Imagination in the Burning Abyss" once per turn. Next: a Dark Magician Ritual Monster (non-Chaos).